Last year my girls had a horrendous habit of leaving stuff at school. Hardly a week went by when jumpers, cardigans, socks, tights, coats and even shoes left the house in the morning and didnt return at the end of the school day. Yesterday morning I told the girls over and over, if they take off their cardigans, put them straight in their school bag. Put their coats on their peg. And please, please bring everything home. As it was a Tuesday, the school bus drops them off at their Grandparents house to wait for either Jay and I to finish work and come collect them. Jay usually gets there first so I was home and starting supper before a very sheepish Bart came in the house. “I forgot my coat. I left it at school” she admitted. Then AJ came racing in behind her. Day one and two items of clothing are left behind. So AJ’s school fashion rebellion continues. I left her downstairs to change from her night-dress into her school uniform the other morning, while Bart and I headed upstairs to choose clothes for playgroup. When we came down again AJ had done a fab job putting on her underwear, school trousers, polo shirt and school sweater. School sweater? She doesn’t normally put that on until two minutes before leaving the house. Oh well, maybe she is a bit chilly. After Bart was dressed, I gathered up all the abandoned night wear scattered around the living room so I could chuck it in the dirty clothes basket. Bart’s dressing gown, AJ’s dressing gown. Bart’s pj top and bottoms, AJ’s night-dress… huh… where was AJ’s night-dress? After quizzing the little monkey and not being convinced by her innocent “I don’t know where it is Mummy”, she finally confessed in the form of lifting her sweater and polo shirt up. Underneath her school uniform she wore a sunshine yellow nightdress with a candy pink dinosaur on it. Is this the start of a teenage rebellion? When my girls hit their teens, I will expect them to try to sneak out the door wearing too much make-up or clothes that their Daddy will totally freak out about. AJ is five… five… should it all be starting now?!!! 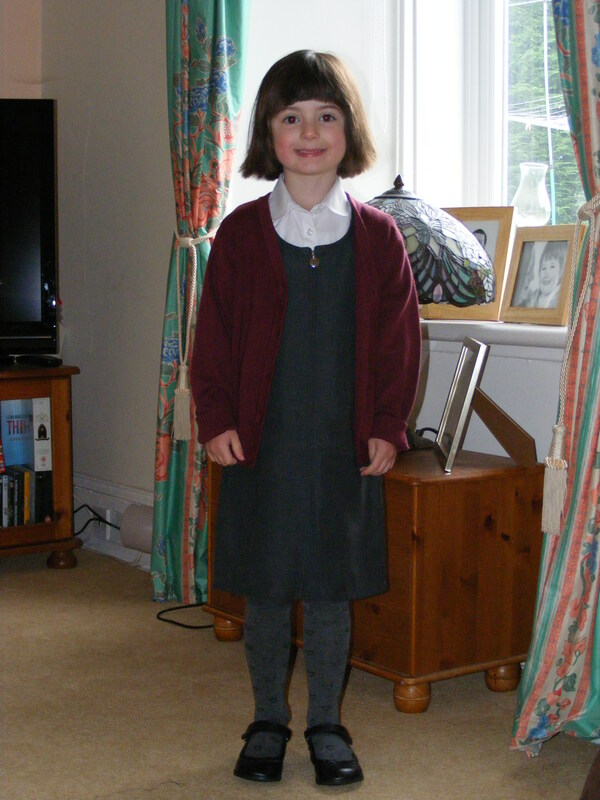 This morning AJ dressed in her school uniform and I gave her an option of wearing either knee-high socks or tights. She opted for tights and when she could not stretch her sisters grey tights up her really long legs, (silly Mummy, you did not check the size) I sent her upstairs to get different pair. “I’m putting them on up here” she yelled down the stairs after I queried what was taking her so long. A few minutes later she casually wandered into the living room. Well, she thought she was being casual. She was in fact mincing across the living room on her tippie toes and drawing attention to her rather odd shaped wrinkled ankles. “How do you know?” she gasped at me. 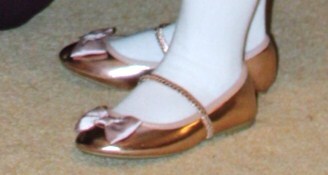 Upon removing the tights she revealed a pair of bright pink ankle socks. Not school wear at all and much too cold for the rainy, chilly April day. The next thirteen years are going to be fun!